Help the prince make amends for his behavior. The Skald-King and the other Ebonheart Pact leaders have established a base at Jorunn's Stand. While the Skald-King recovers, the leaders need to decide how to deal with Fildgor Orcthane. Talk to Eyes-of-Steel and General Yeveth Noramil. Continue talking to Hlotild the Fox to start this quest. "I've been waiting for you to arrive." Why were you expecting me? "Prince Irnskar commanded me to keep watch. He wants to speak to you. He's on the battlements at the east gate, watching the movements of Fildgor Orcthane's troops." "Things are quiet here. For now." You can ask her about the king's health; he is growing stronger and is commanding troops at Jorunn's Stand. You can also ask about how the prince is getting along with the other rulers. While things are still a little tense, the prince has tried to make amends for his behavior. The prince is on a wooden bridge overlooking the eastern gate. He wants to regain the confidence of the Dunmer and the Argonians. You must speak to their leaders, General Yeveth Noramil and Eyes-of-Steel. Eyes-of-Steel wants to measure your worthiness to speak for the prince. She asks you if war makes a person stronger. You can reply it depends, or intimidate her, if you have the perk, telling her to be upfront with her opinion. If you intimidate her, she asks you to challenge Hald Bitterblade, the Stormfist commander, at the east hill and to bring her his head. General Noramil wants you to make a blood contract. He asks you to use his dagger, Viper's Strike, on cultists to charge it. You need to gather Bitterblade's head, and power the dagger. Both are to the east. If you follow the path out the east gate, it will take you past lots of Stormfists and Hald Bitterblade is at the end of it, next to the door. Once you have completed both requests, return to the leaders and give them their requested items. Both of them agree to work with the prince. Return to Prince Irnskar with the good news. 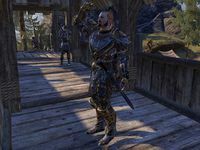 I completed the tasks for the Argonian and Dark Elf leaders. "I received word that General Yeveth Noramil and Eyes-of-Steel will meet with me. I'll show them the respect they deserve and work to strengthen our alliance. Once again, your aid advances our cause. You have my gratitude." This page was last modified on 14 August 2017, at 22:51.